So how do brands go about giving new subscribers the warm welcome they deserve? Because we're gluttons for punishment, we decided to sign up to 60 different fashion stores' newsletters and sat back as the welcome emails rolled in. While sometimes the cloak-and-dagger approach works a treat when it comes to getting people to open your marketing emails, the humble welcome email is no place for mysterious subject lines and sender names (we’ve established they’re already expecting your email and are likely to open it, so let’s not confuse matters). While only three newsletters we received committed the cardinal sin of the sender being completely unidentifiable before clicking ‘open’ (with no mention of the brand name in the ‘from’ or subject lines), several online retailers opted for a fairly unfriendly ‘noreply@’ email address. So once we clicked open on these emails, what did we find? Given the opportunity that welcome emails present, we’d expect the emails we received to be visually exciting, on-brand and full of excuses to click back through to the website. Eighty per cent of the emails we received were image-based like the examples from Nasty Gal and Missguided below, crammed with ‘shop now’ calls to action. Indeed, most of these incorporated a similar navigation menu banner to what would usually be found on their site, tempting recipients back into browsing. Surprisingly, 20% of online retailers still opted to send fairly unimaginative text-based emails that lacked any strong pulls back to the site (see Zara and Monki below). Social is another useful touchpoint to engage new subscribers on, as it’s altogether less intrusive (and less likely to result in spamming accusations). Three quarters of all of the welcome emails that we received included links to the brands’ social accounts (see the example from River Island), and a couple, such as Laura Ashley below, even sent a followup email trying to get us to become a fan or follower. Nearly a third of the online retailers that we encountered offered some sort of welcome gift to incentivise new subscribers to head back to the store. These offers varied from discounts on first purchases to free shipping to entry to competitions. Although offering discounts and other deal-sweeteners might not be every brand’s cup of tea, they do provide an excellent reason to follow up with customers that haven’t yet made use of the offer. Farfetch below sends a series of follow up emails gently reminding customers to capitalise on the time-limited free shipping deal it offers new subscribers, keeping the brand front of mind. While many online retailers send a single email to welcome new subscribers to the party, some are now opting to create a whole series of emails designed to onboard the customer smoothly (for a more detailed look at welcome series, read this post by James Dunford Wood on the topic). 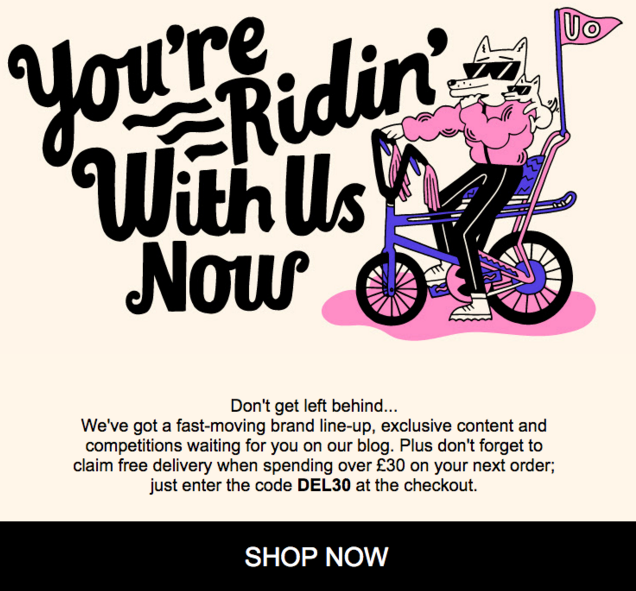 New Look’s social welcome email and the follow-up messages from Farfetch are both examples of this in action. From the others we received, welcome series emails that stood out were from Everlane, who opted for a very personal, plain-text message from a customer service representative checking in and asking whether we had any questions, and another from Boden that focuses on brand building and storytelling. It’s always nice when someone you meet for the first time remembers your name the next time you see them, right? We investigated whether any brands attempted to personalise their welcome emails with first names. Admittedly any amount personalisation is dependent on the online retailer asking for details (like a subscriber’s name) in the signup process, and brands must test to weigh up whether creating extra friction for subscribers is worth it. Interestingly however, while 19 of the retailers we subscribed to asked for our name, only seven went to the trouble of personalising their welcome email - which, all in all, seems like a bit of a wasted opportunity to build rapport with new subscribers. To avoid asking too many questions in the process of subscribing, some brands used their welcome emails instead to encourage subscribers to personalise their updates in order to receive more relevant emails - a great tactic, employed by River Island and Selfridges below, for reducing contact churn. So what have we learned from this exercise in newsletter subscribing? Is it obvious before opening that the email is a welcome email? Have various subject line options been tested? Does the welcome email have attractive images and strong calls to action back to the online store to shop? Does it link to social accounts? 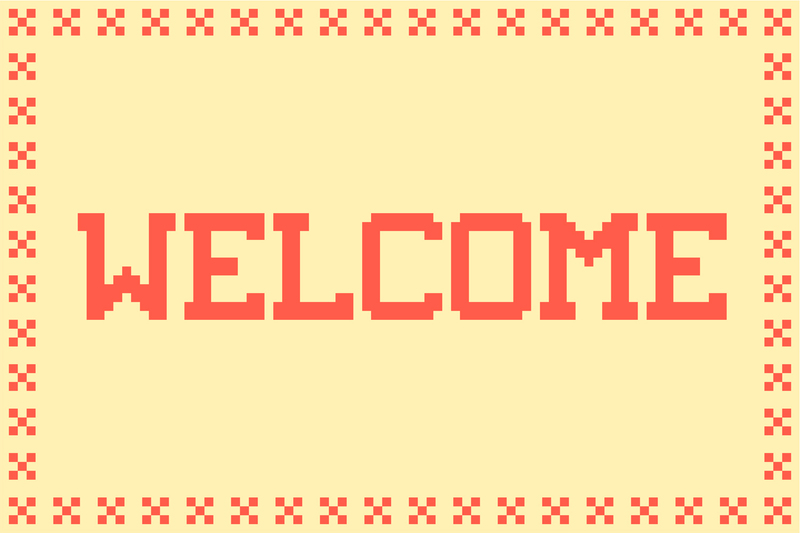 Have you considered setting up a series of welcome emails aimed at onboarding new subscribers smoothly?